There is only one bread we buy. Arnold. I started buying it years ago when I realized that most bread has high fructose corn syrup in it. I couldn’t believe it. Bread? I searched high and low until I found Arnold and haven’t switched since. We like their 100% Whole Wheat though they have many different varieties! Arnold is also sold along side Brownberry and Oroweat. The main grocery in my neighborhood doesn’t seem to carry many of their products, but I’ll definitely be on the lookout now. All are cholesterol free, contain zero grams of Trans Fat, and most importantly have no HFCS. This was a fun post because I was able to experiment with Arnold’s Sandwich Thins & Pocket Thins Flatbread, and Thomas Bagel Thins. All of these meals are Kid-Friendly, Fast, Easy and can be made with staple ingredients you probably have in the house. We have baseball most nights of the week these days and I NEED fast & easy! We love paninis and make them often in our George Foreman. Between your rolls add sliced chicken and cheese with crispy bacon. Grill it to perfection! Add on onion, spinach, or any other topping you like. My kids love bagels and love pizza. This is a favorite and they get to make their own! My plan was to make these for a quick dinner and I thought we had some Applegate Natural Pepperoni and Italian Cheeses in the fridge. I was wrong so we just used what we had – colby cheese and pizza sauce. They didn’t taste plain at all on our Everything Bagel Thins! I love adding crushed red pepper to mine. Delish! I could eat this everyday. Leftover rotisserie chicken, lettuce mix, homemade croutons (which turned out AWESOME! ), and caesar dressing mixed together in a bowl and inserted into the Pocket Thin. Yum! Both Hubby and C’Man put one in their lunch the next day too. Perfect! Truly, these bread Thins are perfect for my family. We really watch the amount of bread we eat and Hubby tries not to eat much at all, so the idea that there is so much less bread per serving is awesome. Healthier with a great taste! You can find more info (and more recipes!) at The Official Sandwich Thins® page, The Official Pocket Thins® page, and The Official Thomas’® page. WIN a Free Coupon for each and $25 Visa Card! The coupons for free product, information, and gift card have been provided by Sandwich Thins®, Pocket Thins® and Bagel Thins ®. This giveaway will end on April 2, 2014 at midnight EST. Winners will be drawn via rafflecopter. Once a winner is drawn I will contact them and they will have 48 hours to reply before I draw a new winner. Giveaway is open to anyone in the US and you must be 18 years of age or older. Giveaway not affiliated with Facebook & I release them of liability. Winner will be posted in the rafflecopter widget. I personally like the bagel thins, the kids would love making bagel pizzas-yum! I would like to make tuna sandwich with honey wheat Sandwich Thins. I don't each much bread either, but I would definately put my salad in a pita. YUM! I would use the pocket thins and put falafels in it! yum! I am going to use the 100% Whole Wheat Sandwich Thins and make me a lean Turkey Sandwich with swiss cheese, tomatoes and lettuce sandwich! I would love to make a turkey and provolone sandwich on the pocket thins! The pocket thins would make a great sandwich, probably tuna or turkey. Thanks for the giveaway. I'd like to use the Bagel Thins to make cream cheese sandwiches. I would like to try the Sandwich Thins and I would make a Bacon, Lettuce, Tomato and Sharp Cheddar Sandwich. I would use the Multi grain pocket thins and make chicken salad sandwich in it, would be great, these are also good to use for barbeque meats. The Individual Bagel Pizzas look delicious! I would love to make a veggie pizza with the whole wheat bagel thins. I would use the Sandwich Thins Seedless Rye and make a reuben! I would put cream cheese and raspberry jam on the bagel thins! I would like to try the Thomas Bagel Thins. They look delicious. I would use the bagel thins and would make pepperoni pizzas! The pocket thins- egg, cheese and bacon sandwhich. I would use the whole wheat sandwich thins for a turkey sandwich. I would make Bagel Thins Pizzas. 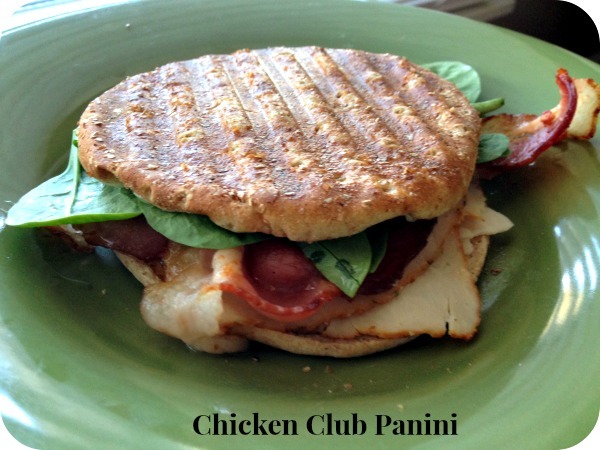 Arnold Sandwich Thins Rolls ~ That Chicken Club Panini sounds fantastic!! I'd use the Pocket Thins to make a tuna and tomato sandwich. They get a little drippy and the pocket would help hold it all together! That chicken club panini looks delicious!!! I would use sandwich thins and chicken salad. I love bagels so I would like to try the bagel thins. I would use the honey wheat sandwich thins to make a turkey, bacon and avocado sandwich. I would use the pocket things to make a corned beef sandwich! I'd like the thin bagels. I would make mini cheese pizzas. I think it would work well to use the Bagel Thins to make a breakfast sandwich, maybe with sausage, egg, and cheese. Thank you! I like peanut butter on my sandwich thins!!! Arnolds is great bread. I'd like to try the Bagel Thins with some cream cheese for a quick breakfast treat!! I would like the Multi Grain and would make a turkey! Yum! PB & J on bagel thins. I would use all 3 of them and be looking for them in the store tomorrow night at work ! I would use the pocket thins and make tuna salad and lettuce. Another thing I would make with the pocket thins are cut up all different veggies and drizzle with a light dressing . I'd use bagel thins to make bagel pizzas! I would like to try the Sandwich Thins. Would be great for my husband's lunch Thank you! I'd use any of them but the pocket thins would probably be my favourite. I'd stuff them with tomatoes and sliced cheese then heat it until; the cheese just starts to melt. Yummy. Thanks for the giveaway. I've bought the bagel thins before for a treat at breakfast. Usually that also means I get to treat myself with strawberry cream cheese for on top of them too, but sometimes I will make hubby's sandwiches for work with them, just to give him variety. I would use the bagel thins. I would make tuna salad with tomato on a bagel thin. the pocket thins and I'd make my version of a gyro... yum! I like breakfast sandwiches on english muffins! I"d make sandwiches out of bagel thins! I'd love the Bagel Thins! We enjoy making meat sandwiches with cream cheese, cucumbers, etc. on a bagel. The Bagel Thins would be just as tasty but with fewer carbs. I would use thomas bagel thins plain to make a turkey bacon, swiss sandwich. I would make a breakfast sandwich with bagel thins! I love the sandwich thins. I'd love the bagels, too. I would make an egg bacon and cheese breakfast sandwich on the bagel thins! I would use the Cinnamon Raisin Bagel Thins with jam, swiss cheese, sliced pear, and turkey sandwiches!!! SO GOOD! I'd use Thomas Bagel Thins and make pizzas for under the broiler, adding different toppings to each one! I'd use the Healthy Multi-Grain bread. I would use the sandwich thins-for my wonderful roast beef sandwich! I'd use the Bagel Thins and make a veggie pizza - thank you. I woild use yhe sandwich thins to make a turkey blt. First I'd make a tuna salad sandwich on the sandwich thins. Thanks for the contest. 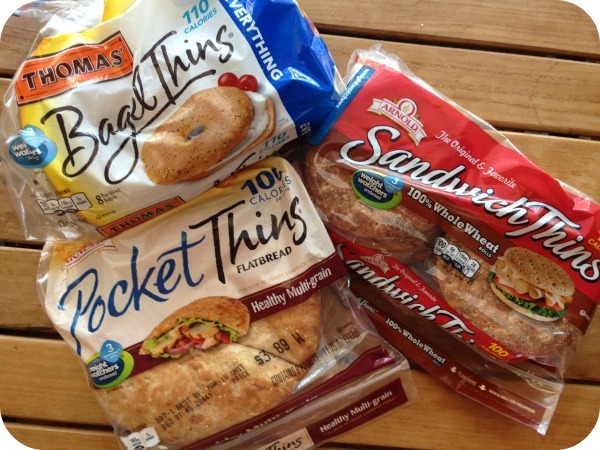 I would use the healthy multi grains Pocket Thins to make myself a turkey & swiss sandwich! I have been using the multi -grain bagel thins for awhile, to make pizzas ohhh yea !!! Good stuff!!! I'd use them all, but especially the bagel. I love it with cream cheese. I want to try the bagel thins. Bagels are my favorite out of them all. I'd use the pocket thins to make a falafel pocket! I love the whole wheat sandwich thins, and I usually make breakfast sandwiches. I think I'd use all of them, but I really want to try the Sandwich Thins. I think the kids and I could make some great sandwiches, and have a fun picnic. Thank you for the giveaway!! I would like to try the multi-grain sandwich thins, I would use them for egg and cheese sandwiches. I love the bagel thins! I buy the blueberry cream cheese and toast the bagel and put that one and its so yummy! I would use the Pocket Thins. I would make turkey breast with cream cheese and cranberry sauce sandwiches. The chicken ceasar pita looks good. I would use the The Bagel thins and make a toasted bagel sandwich. I'd use the Pocket Thins to make a tuna salad with celery sandwich. The pockets are cool convenient! OMG, definitely that Chicken Ceasar Pita!! I would use the pocket thins for chicken salad. I would try Thomas’® Bagel Thins®. I'd like to make a BLT with the sandwich thins. My daughter would probably enjoy a peanut butter and banana sandwich made with those. I would choose the Arnold Sandwich Thins Rolls.I would put my homemade chicken salad on them. I would use the pocket thins. I would make tuna salad with lettuce. Another thing I would make are cut fresh veggies and put a Italian dressing over it . I already use the pocket thins and love them, I usually make a seafood salad out of the crab chunks, celery, onion, and may it is so good. I would love to try the bagel thins. I'd use the pocket thins and make a gyro! I would use the Whole Wheat Sandwich Thins to make a turkey and cheese sandwich. I definitely would use the Pita and make a YUMMY tunafish sandwich!! I'd like to try the Everything Bagel thins and make a BLT! I'd use the pocket thins for chicken ranch wraps! I would use the Whole Wheat Sandwich Thins and make a BLT sandwich - yum! 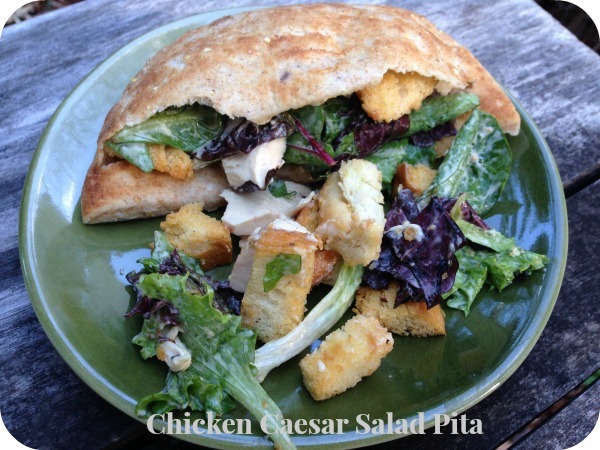 I would make your Chicken Caeser Salad Pita, it looks delish! I would use the 100% Whole Wheat Sandwich Thins and make a peanut butter, honey and banana sandwich! Yum! I LOVE the sandwich thins, they are the perfect size for Jennie O turkey burgers! I would use the pocket thins and stuff it with chicken salad and lettuce. I would use the muffins for breakfast sandwiches. The other into pizzas. I would use the pocket thins to make with tuna! I would use the Thomas bagel things to make toasted ham and cheese. I would make individual bagel pizzas using the Thomas Bagel Thins. I would use the pocket thins to make BLT's! Right now I am craving chicken salad in a pocket thin! We use them all the time. They are always in our packed lunches, we love them. Would love to try the pocket thins for a breakfast sandwich of cheese, fried eggs and ham. I would like to try the Bagel Thins to make some pizzas! I would use the Arnold Pocket Thins® Flatbread Italian Herb Pocket Thins and make a pesto mayo turkey sandwich with lettuce and tomatoes. I;d try the whole wheat. I use the Pocket Thins with Sloppy Joes. I would use the Sandwich Thins for a thin sliced turkey and cheese sandwich. We use Sandwich Thins regularly now, but the bagel thins would be great for "pizza toast" as we call it with our 2yo daughter! I'd like to use the Bagel Thins with turkey, lettuce and FF mayo. I like the pocket thins to make hummus sandwiches. I would probably make tuna salad in the pocket thins. I would use the sandwich thin bread for some healthier veggie sandwiches! Pocket Thin Flatfreads for my Greek Chicken Salads! I want to try the Pocket Thins with Chicken Salad, thanks! With bagel thins, I would make a cheese pizza! I would like to try the bagel thins. I would make breakfast sandwiches with the Bagel Thins. I would use the Everything Bagel Thins and make turkey and swiss sandwiches. I'd use some Arnold wheat sandwich thins and make Margherita Pizzas (recipe from the site)! I would use the bagel thins and make a tomatoe with cream cheese toasted bagel! I would use the bagel thins and make an egg breakfast sandwich. I think I'd really like the Bagel Thins, but I'd love to try the Sandwich Thins! They are such a great idea! I always thought sandwiches tasted more like bread than anything. These thinner slices would allow the veggie and cheese flavors to come through. Thanks so much for the chance! I would make a chicken salad sandwich with the Pocket Thins. I think it would be great. I would use the Bagel Thins and I would use with Tuna Salad! I would use the Whole Wheat Sandwich thins to make a Turkey Club Sandwich. I would use the Sandwich Thins and make a BLT! I would use any of them because that is about all we buy for sandwiches. I would make a turkey, american cheese, lettuce, avocado, and tomato pocket with ranch dressing. I would use the pocket think to make tuna salad pockets. I would use the flatbread to make BLT's. I'd use flatbread for a blt. I would use the Flax and Fiber Sandwich thins and make a Hummus 'pizza'. I would use the whole wheat Sandwich Thins Rolls to make turkey sandwiches. I would use the honey wheat thin to make a chicken salad sandwhich. Thank you! The Southwest Lime Chicken Sandwich with the Arnold whole wheat thins looks delicious! I would use the wheat sandwich thins and make a tuna melt. The pizza roll idea is a great lunch suggestion. The pocket thins with a tuna salad sandwich sounds delicious! I would love to try the Arnold Pocket Thins Flatbread for Sandwiches and salad stuffing along with the Thomas Bagel Thins for breakfast and individual grilled veggie Pizzas! the whole wheat thanks ! I would love the [pocket thins most and would pack it with veggies and feta cheese! 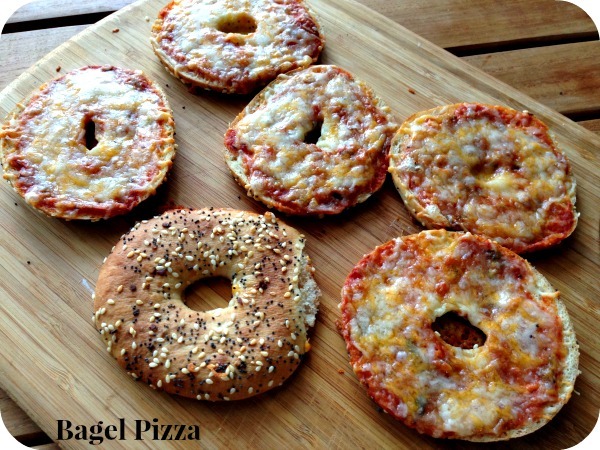 I would use the bagels and would love to try the bagel pizza idea! It looks really good. I would definitely make the Bagel Pizzas with Thomas’Bagel Thins, and a Turkey & Roast Beef flatbread panini with the pocket thins! YUMMY! I would use the sandwich thins and make a ham and cheese sandwich. I would use the Pocket Thins to make a tuna salad pita! I would use the Whole Wheat, and I would make a cheese and bacon bagel. I would use the bagel thins to make bagel pizzas! Such a good idea!